Actually before we get too far into this, let me make a statement. Some might argue, but not many 🙂 The typical Sales Funnel (or List Building Funnel as I prefer to call it) involves a free giveaway and a one-time-offer that you sell. The money from the one-time-offer is NOT profit. It is designed to offset the cost of the advertising that drove traffic to the free offer squeeze page. The majority of your sales come from your list AFTER they have subscribed. That is why you treat them well and work to build a good relationship with them. Note: This post talks about selling an info product – something your purchaser can download. You would have to make some changes if you are selling a product you need to ship to the customer. There are lots of articles about how to create an effective Sales Page. I’m not going to go over that here. I do like to use a plugin called “WP Hide Post” to make Google ignore the page and to make it invisible when people search my site. (Choose the option to Hide the Post and uncheck the option to “Include in searches”. After you install this plugin, its option will appear in the right sidebar as you edit your Sales Pages. The first step is to get a Premier PayPal Account. These are free, they just require that you jump through a few more hoops to prove that you are you. Usually this is under the “Products and Services” tab. If you don’t see it, use the Search Button. I’ll be honest, I sometimes can’t find this section by following PayPal’s menu system. They change it now and then and things move. I search for it in the upper right corner and bingo – there it is. Right now it is under a large tab called “Merchant Services” and there is a large area (that actually a button) called “Create Payment Buttons for Your Website.” . There are several boxes with the name of a tool in each box. This is the one you want. Options inside the Payment Buttons Tool. Choose to Create a Similar Button based on the Simple Payment Button. The first step is where you describe the item and set a price. (Note: It is a common practice to have a product listed in several places. The full retail price is used is some places and discounted prices (One-Time-Offer Prices) shown in other places. Use a title that will tell you where you plan to use this button. #3 – Enter the price. 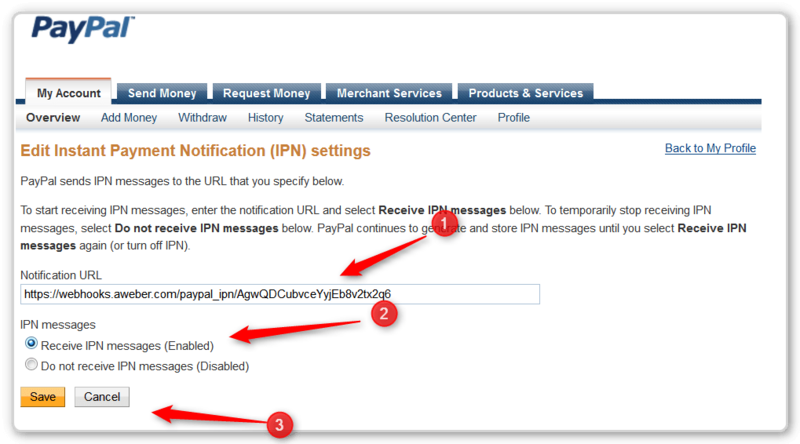 #5 – Use the ID number option – even though PayPal’s help says your email may show. #1 – This should be already set. #1 – No we don’t want the customer changing the quantities – an info product come in quantity 1. #2 – I usually don’t feel a need for the customer to give special instructions on an info product. 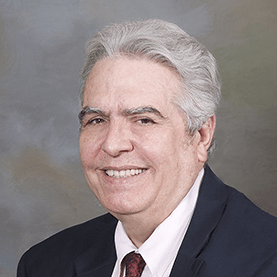 #3 – We don’t need a physical mailing address. #4 – You can create a page that customers go to if they cancel and order. I usually don’t. For a high selling item I would. #4 – CRITICAL – This is the Thank You/Download page. You send them to a page on your blog where you have a link to download the product. You say THANK YOU and it is a good idea to offer them something else while they are there. This is where the highlight and copy the HTML Code. Press the “Select Code” button and all of the HTML code is highlighted. You can press Ctrl-C or Cmd-C or Right Click–> Copy to place this code in your PC’s clipboard. This is the code you will paste near the bottom of your Sales Page. There are two steps to getting AWeber and PayPal ready to subscribe your buyer to a special list and one step that is done for each button you create where you want the buyer put on a special list. 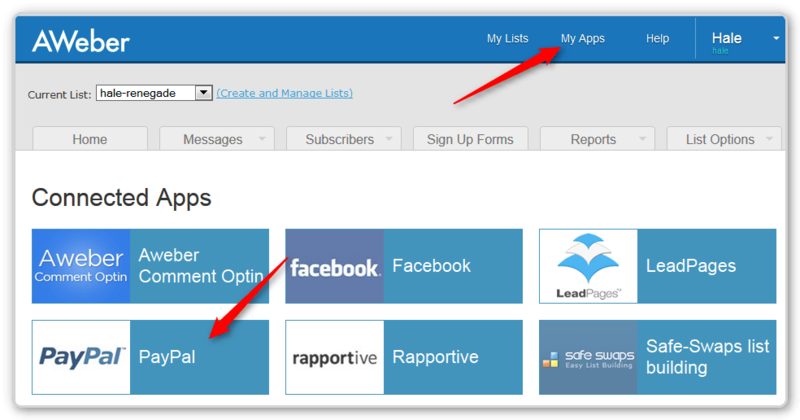 At the top of your AWeber page, select “My Apps” and find the PayPal App. Once you have clicked on the APP button you will see this screen. 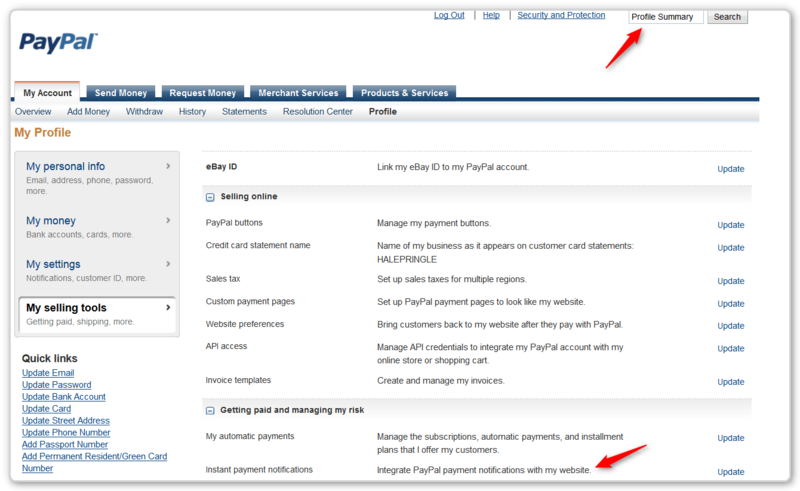 #3 & #4 – Again AWeber is trying to show you what PayPal will look like. #5 – We will come back to this section later. Here I searched for Profile Summary and clicked on a button to show the summary. Part way down the right hand side is the Instant Payment Notification Code setting We will click on the update button. #1 – Paste the URL/number we got from AWeber here. These setup steps need to be done ONCE. You will not need to do them each time you create a new button. However you will need to associate each button with an AWeber list. Go to My Apps and Click on the PayPal App again. #1 – I said we would come back to this. This section is done for each new button. #2 – Make sure the “Multiple Buttons” option is checked. #3 – The left drop down should be set to the button your just created. If not, find it in the list. #4 – Select the list you created for these buyers. Now when someone pays using the button you just created, they will automatically be subscribed to the list we just connected to that button in AWeber. There you have it. Lots of little steps, but they all make sense once you understand the pieces and how they work. 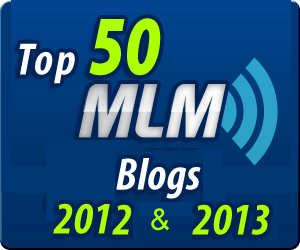 Thank you so much for the latter part of this blog post. Once again you have solved my dilemma…how to get my customers a chance to subscribe to my list. 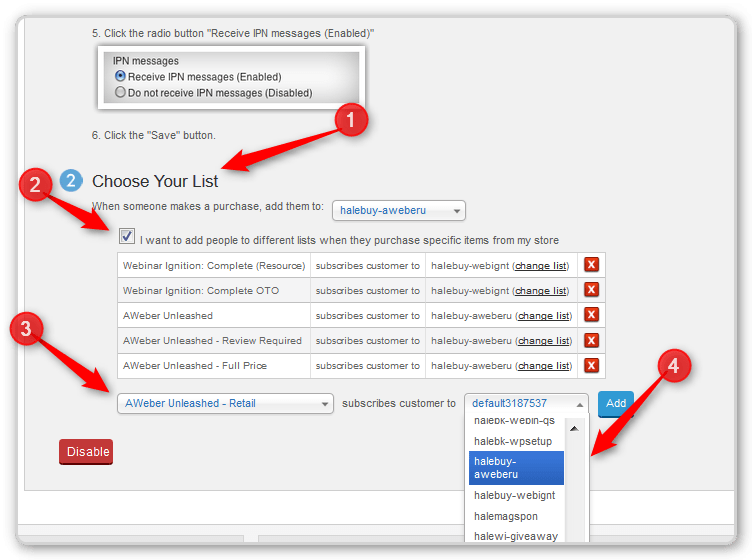 When my customers buy via this method using a paypal button linked to my aweber account, they are subscribed to my aweber list, however they still need to confirm their aweber opt-in message, even though I’ve turned off “confirmed opt-in” in aweber. Do you know if there is a way around this? Technically since they’ve purchased from me, they have verified their interest in my information. Right? Once I have turned Confirm Opt-In off I only get a few who need to confirm their opt-in. Those few are people who use names with 3 characters or less or use obvious words to indicate they are using a junk account need to confirm their email address. The rest should not need to confirm. You can contact tech support if you think you have people who shouldn’t have to confirm and still do. Thank you SO much. 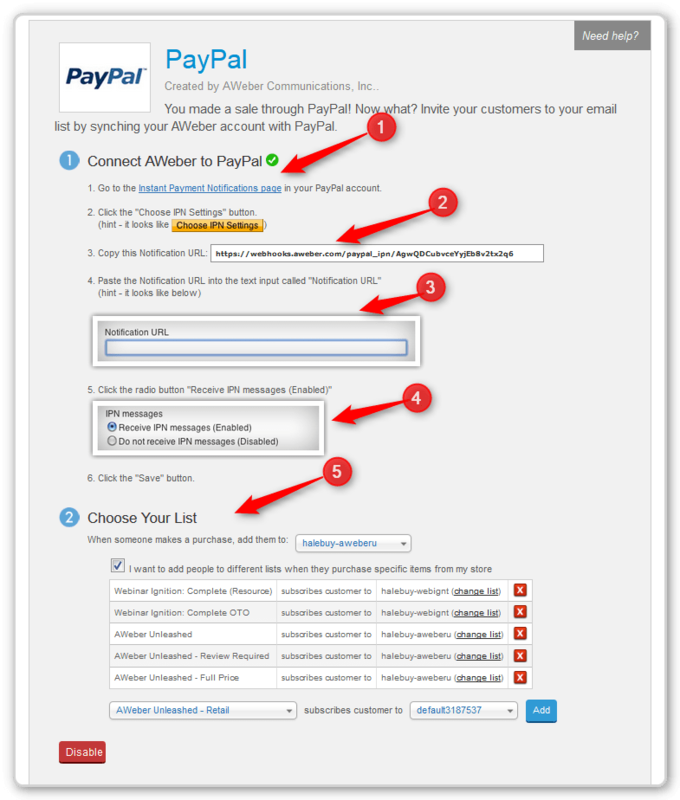 I spent all day trying to figure out paypal button integrated with adding to aweber list. Your post helping me within 30 minutes to get this set up. A life saver! Thanks again.